Postural stability or postural sway is a common feature investigated in clinical and sports settings. Centre of mass (CoM) and centre of pressure (CoP) are the main features available to quantify postural stability, with centre of mass being a 3-dimensional movement whereas centre of pressure varies in two dimensions. Temporal and 2-dimensional data have been intensively studied for both CoM and CoP including fractal analysis. 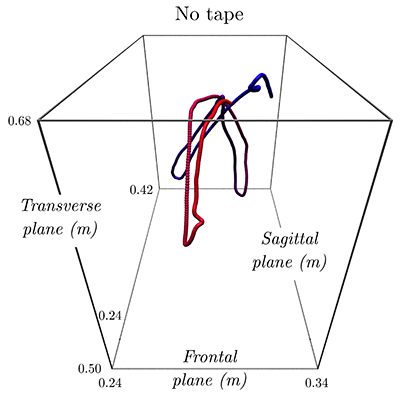 The current study applied a 3-dimensional representation of planar and vertical data to investigate changes in CoM whilst undertaking a balance test. The box-counting fractal analysis method was applied in 3-dimensions and the fractal dimension of CoM dispersion determined. Eight participants were recruited to undertake the Y-Balance Test, which requires participants to stand on their dominant leg and maximally stretch the non-dominant leg in the anterior, medio-lateral and medio-posterior direction. Participants were tested with and without support taping (static tape, ST) applied to the ankle, lower leg and thigh. 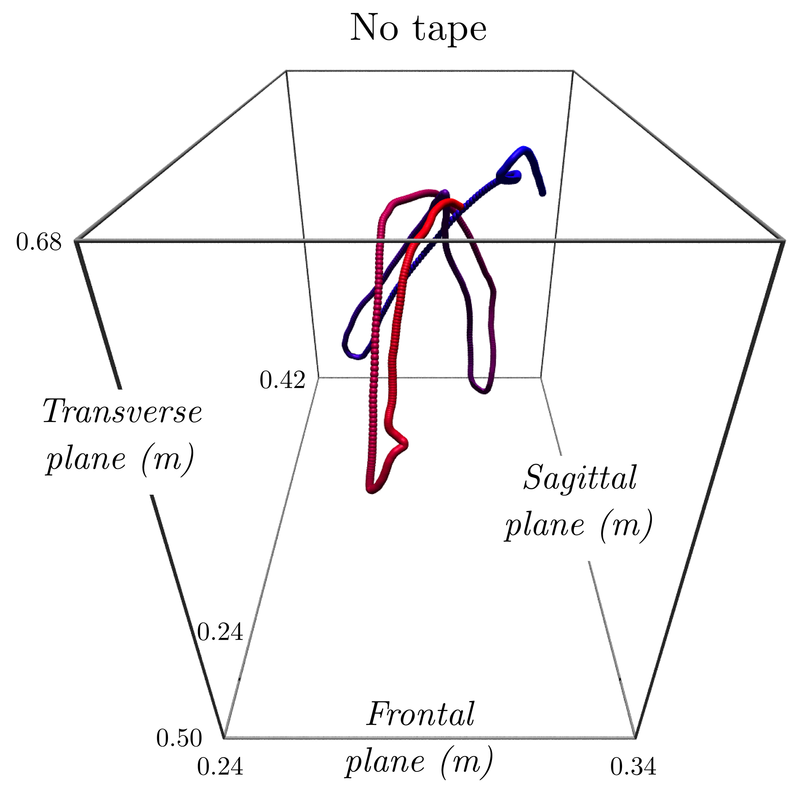 3-dimensional motion capture data and ground reaction forces were used to calculate CoM following kinetic and kinematic assessment of the pelvis and lower limb. 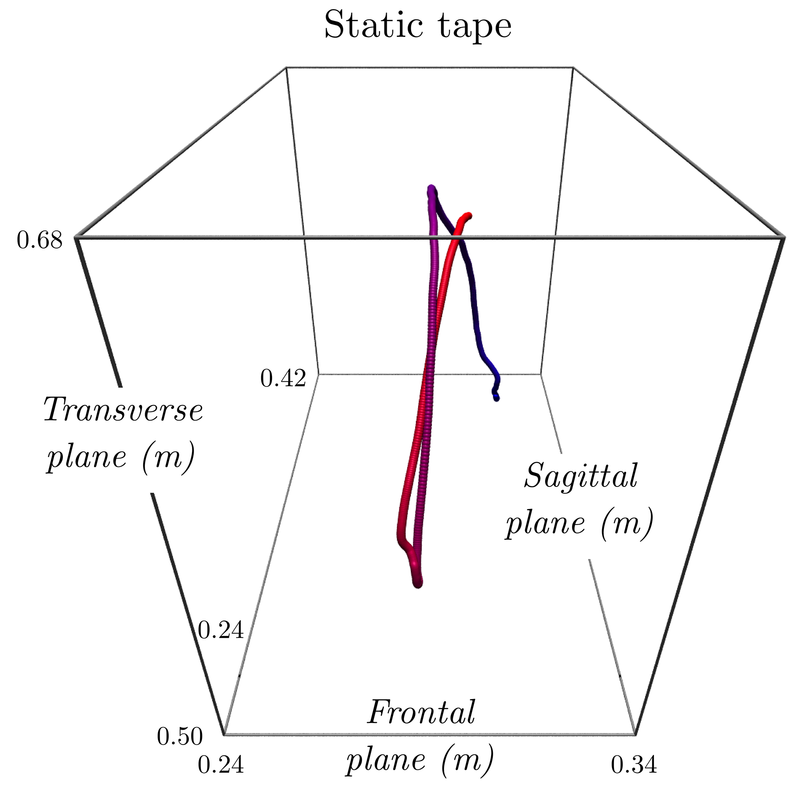 Static taping significantly decreased complexity of CoM dispersion (postural sway) compared to no taping (x̅±SD; 1.29±0.05 & 1.20±0.04; p=0.003). 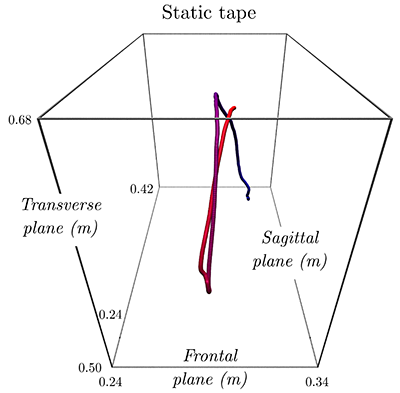 Our results indicated that 3-dimension fractal analysis is a robust method to investigate postural stability, it provides objective data on the complexity of CoM dispersion during a balance test and the effect of taping. The 3-dimensional analysis provides a more complete indication of complexity compared to current 2-dimensional CoM/CoP measures, as too much or too little complexity in CoM dispersion indicates instability and vertical changes should be taken into account in addition to horizontal sway. Future work will include a larger sample size and investigate factors that may contribute to increased or decreased complexity and effect of taping.